Yanira Cortez, Deputy Attorney for the Environment for El Salvador's Human Rights Ombudsperson's Office and Marcos Gálvez, President of the Association for the Development of El Salvador are calling on Canadians to help solve the water crisis by challenging investor-state dispute settlement (ISDS) mechanisms that have enabled corporations to sue governments for hundreds of millions of dollars when policies aimed at protecting the environment threaten corporate profits. The United Nations Conference on Trade and Development (UNCTAD) reports that the number of known investor-State disputes reached 514 in 2012 and argues that foreign investors are increasingly resorting to investor-State arbitration. Many of these cases target national environmental policies and environmentalists argue that the very threat of ISDS puts a chill on environmental policymaking, making investment treaties a serious obstacle to the bold strategies required to address a rapidly deepening environmental crisis. Salvadorans are currently awaiting a ruling in a six-year legal battle initiated by Vancouver-based mining company Pacific Rim and now pursued by the Canadian-Australian firm Oceana Gold, which acquired Pacific Rim in 2013. In spite of the fact that Pacific Rim had failed to meet Salvadoran regulatory requirements, the company is suing El Salvador for US$301 million for not having granted them a permit to operate a gold mine. The case is being heard at the World Bank's International Center for the Settlement of Investment Disputes (ICSID), which exists outside of national jurisdiction. Its mandate is to examine the rights of foreign investors without taking into consideration domestic human rights, labour and environmental laws. El Salvador -- a small, densely populated country of six-million people -- is one of the most water-stressed countries in the world. The country's battle against mining is directly linked to initiatives taken within the past decade to develop long-term strategies to address its urgent water crisis. According to Yanira Cortez, Deputy Attorney for the office of the Human Rights Ombudsperson, the water crisis is a ticking bomb. A 2010 study by El Salvador's Ministry of National Resource and the Environment (MARN) found 98 per cent of water sources were deemed to be contaminated and unfit for drinking. In 2005, when residents of Cabanas learned that a Canadian company, Pacific Rim, had begun explorations for a gold mining project in the area, they commissioned an independent review by U.S hydrologist Robert Moran. He discovered that the mining company's assessments had serious gaps: it lacked the baseline water quality and quantity data required for an accurate examination of watershed impacts; it also failed to consider the costs to the community of its use of large quantities of water free of charge. Moran's report concluded that the project would spell disaster for two thirds of the country's population who are dependent on the Lempa River watershed for their drinking water, livelihoods and other basic needs. A movement to protect the Lempa River watershed emerged out of the struggle against the mining project and evolved into a national coalition to ban metal mining in the country, known as La Mesa Frente a la Mineria Metalica (National Roundtable Against Metal Mining). La Mesa's message rapidly resonated across the country. A bill to ban metal mining has the support of more than 62 per cent of the population and was initially backed by the FMLN, the left-of-centre party that has ruled El Salvador since 2009. A de facto moratorium was declared in 2008 when then-President Antonio Saca of the conservative ARENA party agreed not to issue new mining permits. Three successive Salvadoran Presidents have maintained the moratorium. The Salvadoran Parliament has been negotiating a bold water policy proposal since 2012 to address the water crisis. It would grant greater power to Salvadoran communities currently engaged in battles against multi-national corporations by setting up a hierarchy of water use that would prioritize domestic use and local food production. It would also give impacted communities the right to consent to the use of community water supplies. When Oceana Gold acquired Pacific Rim, the Vancouver-based company had little more to its name than a multimillion-dollar lawsuit. The only advantage for a major mining corporation like Oceana Gold would be the opportunity to punish a country like El Salvador for pursuing policies that threaten the industry's ability to expand its operations in a mineral rich part of the world. Costa Rica, which has a ban on open-pit metal mining, is facing a similar lawsuit by Calgary-based Infinito Gold, which is suing the government for $94 million. Cortez and Gálvez are calling on Canadians to join the push to eliminate ISDS in order to prevent future lawsuits. The tour will highlight the fact that investor-state dispute settlements have been equally harmful to Canadian environmental measures. Most recently, Lone Pine Resources used the dispute settlement provisions of the North American Free Trade Agreement to sue Canada for $250 million in compensation and potential lost revenue due to Quebec's ban on fracking. Oceana Gold's investor-state dispute settlement is one of nearly 200 new cases being heard at the International Center for the Settlement of Investment Disputes (ICSID). ISDS has become a powerful weapon for some of the most environmentally destructive corporations in the world. However, corporations are only able to sue the states who sign trade agreements or investment treaties containing ISDS provisions. All it takes is political will for governments to walk away from ISDS commitments and reclaim the right to protect their own environment. El Salvador recently reformed its investment law to prevent future lawsuits by foreign investors. Brazil has never signed any treaty with ISDS provisions. Indonesia, South Africa, Bolivia, Ecuador and Venezuela are revisiting their bilateral investment treaties. Getting rid of ISDS in itself won't solve the environmental crisis. But it would give communities like those in El Salvador the ability to develop their own environmental strategies without the threat of being bullied by abusive multinational corporations. Cortez and Gálvez are speaking in Montreal, Ottawa and Toronto May 11- 15. For details, visit: Stop the Suits Tour, MiningWatch Canada. 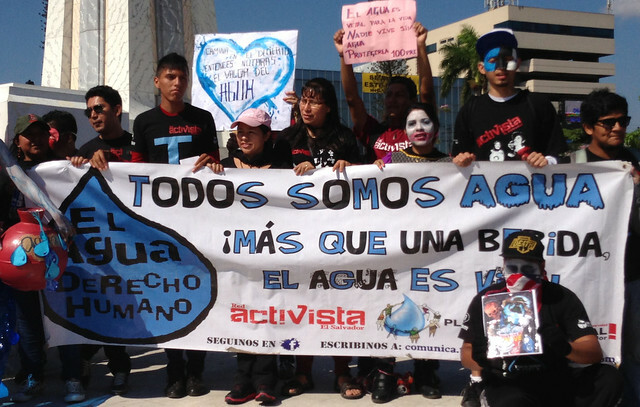 For more information about the campaigns to protect water in El Salvador, download the report: Water at the heart of El Salvador's struggle against neoliberalism. Maude Barlow is the Chair of the Council of Canadians and founder of the Blue Planet Project -- a global initiative to promote water as a human right and a vital part of the commons. Meera Karunananthan is the international water campaigner for the Blue Planet Project.